Your organization’s social media presence is the new Digital Lobby. It can set the baseline and the tone for your customer’s expectations. However, because the transactions are out in public view, scale can become an issue. The natural variations in how your customer care representatives handle your business are there for all to see. As your team grows, it is important to cultivate that growth to keep your responses conversational and consistent in tone. Our team can work with yours to develop the persona that your associates can inhabit, ensuring that your customers’ experiences are more uniform, less variable. Additionally, we leave behind protocols that ensure the training sticks, and that as your team evolves, so does the community tone. 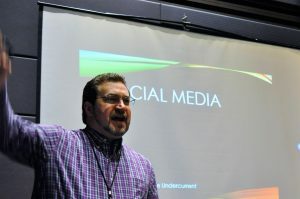 Ike Pigott has delivered keynotes and workshops at more than two dozens conferences centering on social media, customer experience, and outage communications.